The last of our space theme activities today. I love how activities with T can now be more interactive and how I initially set out to do something evolves as T make suggestions or asks questions which lead to a change in direction from the original objective. For this activity we started out by looking at T's planets and space book together, we talked about the differences in the planets, that the sun was fire, that the earth was land and sea, that the moo had lots of craters and that Jupiter has rings around it. T was getting really interested and when we progressed to sizes we started to find balls which represented the different planets we were discussing. We found suitable balls for the sun and Jupiter but couldn't find anything smaller for earth and the moon so we blew up balloons to use instead. Once we'd discussed which planets were bigger and smaller etc, we moved on to the colours we would use for our painting, I got all the paints down and planet by planet we talked about what colours were needed. 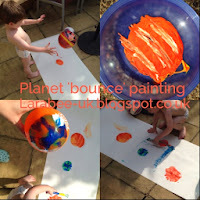 As we did this activity outdoors I let T squirt the paint into trays and mix it which he thought was wonderful. When I told him to dip the ball into the paint and bounce it on the paper (a roll of backing wallpaper I'd already rolled out!) he thought this was fantastic, when the ball double bounced onto the patio, I'm sure he expected to get told off! Instead of bouncing the balloons, we just dipped them into the paint and then squidged them onto the paper, those results were much better but not so much fun. Once we'd painted our planets, T decided that he wanted to do some conventional painting and painted over the sun and Jupiter and started to paint anything else that he liked, so although were weren't left with a big frieze of planets which is what I envisaged, I loved the fact that T was involved and making decisions and seemed to be having fun doing that. This was definitely one of my favourite activities. This months theme is 'space' we're exploring the planets, doing some fun space themed activities and eating some inter-galactic food! You can see all our space blog posts here.